I first came across the phrase ‘tough love’ when I was one week into a ‘Medical Faculty Orientation Program for International Students’ in University of Newcastle, Australia for my undergrad study. Ben made us understand that tough love is a phrase used when someone treats another person severely and strictly for that person’s own benefit (regardless of whether or not they REALLY love that person, I guess. Because we really didn’t think Ben actually loved us. Hahha). So at the end of the three months orientation program, ‘tough love’ is our favourite phrase, repeated in nauseating frequency among all of us whenever we were not acting really nice to each other. The phrase gradually lost its heartwarming effect because whenever we acted rudely to one another, we simply justified it with the ever-convenient phrase of ‘tough love’. Hahaha. When more and more paediatrician in the US specifically declared that they are going to turn away anti-vaccers from their private practice, they justified the move by saying that they don’t want to be responsible for someone’s death from an illness that was preventable. The phrase ‘tough love’ reverberates again and again. For the US, the recent Measles outbreak is the nation’s second biggest Measles outbreak for the last 15 years. Most of the cases have been traced to be originated directly or indirectly in Disneyland in Southern California. And most that were infected have not been vaccinated. And new cases are still emerging. Can you imagine the sort of public health nightmare they are facing over there? 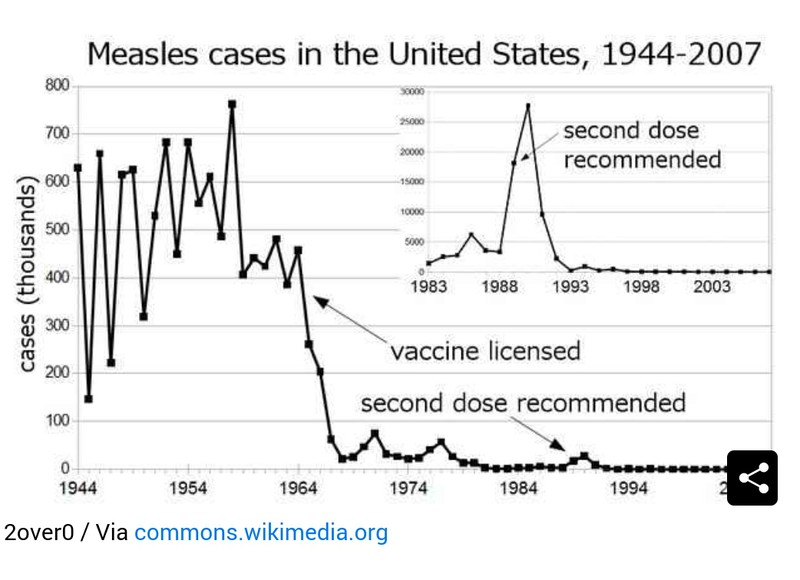 If we go further back into the past, we could see how the Measles outbreak is associated with poor vaccination rate and the lost of the herd immunity. To achieve the herd immunity, a critical portion of the community must be immunized against a contagious disease to protect most members of the community. The herd immunity protect unvaccinated members of the community on the basis that when a lot more other people are immunized, the lesser outbreaks there will be, and thus even the unvaccinated patients will not be infected, because there is just NO OUTBREAK. Critical number of people are immunized –> Herd Immunity Achieved –>No outbreaks/Less outbreaks –> Vaccinated AND unvaccinated individual don’t get infected. So, it was NOT because the immune system of the unvaccinated person is so superior that they are infection-free without being vaccinated. This graph is showing a sharp decline in incidence of Measles after the introduction of the MMR vaccine in the year 1963. The incidence of Measles started to climb up when more and more anti-vaccination individuals started refusing vaccination for their children, basing their entire decision on a morally-dubious doctor, pseudoscience ‘exposes’ long debunked, and impressive conspiracy theories that reaffirm the power of human imagination. Gradually, the power of herd immunity is weakened. When herd immunity was at its peaks, the anti-vaccers gloated over the ‘evidence’ that their immune system was robust and strong without any vaccination. Now, the decline in the herd immunity resulted in multiple outbreaks of Measles in the US that could bring permanent morbidity and mortality to those infected. Amazingly, the Anti-Vaccers still did not feel guilty. *sigh* If this is how they think, no wonder they were so easily misled. They don’t know about the immunocompromised elderlies/cancer patients on chemo/HIV patients/ who are dependent on the herd immunity to prevent infection even though these patients have been vaccinated in the past. So, they don’t feel blameworthy. Instead, they were admirably delighted to bear the painful consequences from their decision, that they mistakenly thought will not affect others. To be honest, I was surprised that our ethics lecturer was not a psychiatrist. I have always thought that psychiatrist make for a more natural ethicist than any other specialty. NOT because doctors of other specialty are less knowledgeable about ethics (ethics is something that anyone can just pick up a book and read), but because in psychiatry, ethics is like our bread and butter (really, our rice and sambal belacan). I choose to do psychiatry partly because of this aspect of it. In psychiatry, we are fascinated with the mind. How people think? What motivates them? What are their defense mechanisms against stressors? We have to learn about cognitive development theories. Paget’s theories of cognitive development is about how a newborn slowly progress into having abstract logic and mature moral reasoning. In Kohlberg’s Stages of Moral Development, the ‘Heinz Dilemma’ used by Kohlberg in his experiment has been asked time and time again in many ethics lectures across the world. In psychiatry, we also come across the concept of cognitive dissonance and fallacy of fairness. I am sure there are a whole lot more other theories and concepts I have not yet come across, myself. All together, they make up many aspects of ethical contemplation. So I thought, the role as an ethics lecturer falls more naturally to psychiatrists than to surgeons. However, Charles is an excellent ethics lecturer. I had no doubt of that after his first lecture. There were good case scenarios that were also current, excellent reasoning and thought processes, exciting twists and turns of interactive arguments. I had a good time in his lecture hall, that’s for sure. I believe, that the current issue of ‘paediatrician turning away anti-vaccers from their practice’ should be discussed in any medical school ethics class. As doctors, we have the moral obligation to treat everyone without prejudice. We treat all races. We treat criminals, we treat rapists, we treat murderers. We leave their crimes to the judiciary system. So, How ethical is the ban? There are a few aspects that need to be looked at. Well, I think that’s an acceptable reason. But the ban cannot be justified simply by having a good reason for it. You also have to look at who are affected by the ban? Who are we trying to punish, here? 2)So who will be affected by the ban? -Think of the unvaccinated kids/infants who do not have the mental capacity to give consent, and thus did not have any say in what their parents have chosen to do on their behalves. They, the innocent wide-eyed kids – and not their parents – are the ones we end up punishing. -I am all for ‘tough love’ as I have established from the start, but it is still pretty difficult to stare the unvaccinated kids in the face and turn them away when they need treatment, especially when it is the parents’ fault that they are not vaccinated. -In general, we have to treat patients with the issue of consent at the forefront of our mind. When they withhold their consent to one particular aspect of a treatment, the doctor is not justified to withhold ALL other treatments that patient has no problem consenting. In the past, we have had no problem treating unvaccinated patients even when they refuse vaccination. We simply recognize their autonomy and just treat them for whatever ailments befalling them at that particular time. -However, in the midst of the Measles outbreak, some doctors then decided to boycott unvaccinated patients by turning them away from their practice. Is patient’s autonomy changeable upon different circumstances? And if yes, what are those circumstances? We don’t want to encourage doctors to simply take an easy way out. That anytime a patient refuse a beneficial treatment, we start to turn them away. That is not the doctor we claim we want to become when we proclaim the Hippocratic oath. 4) Will the ban produce any effect on the outcome of the spread of the disease? Ok, so you ban the unvaccinated patients from your practice? So, how about continuity of care? Will they at least be referred to another GP/paediatrician? That’s the least we can do when we do not want to treat any patient for personal reason, right? We have to refer them to another doctor who will see them. -And if they ARE referred to another GP /paediatrician, the risks of disease spreading in a doctor’s waiting room is simply being transferred from YOUR general practice to ANOTHER general practice. -Not much of an outcome, is it? -Unless…we are willing to be uniform and united and said: no doctors shall treat unvaccinated patients! -I don’t think we will ever do that. It is just too much against our natural instinct as healers. If you refuse to treat unvaccinated patients, that’s okay. But at the very least, we HAVE to make sure they are being treated by SOMEONE, somewhere. Orelse, there is NO JUSTIFICATION for turning away unvaccinated patients. -And thus the outcome of the ban – in terms of disease spread – is really NOT MUCH. 5) How long will the ban continue? -It takes a long process of education and propagation to change a belief that is so firmly held, it is unshakeable. -How long will you have the fortitude to turn away patients who need you? Do you ban them ONLY when there are outbreaks, and then discontinue the ban during the time of calm and ease? -You see, before you decide on a ban, you have to be pretty damn sure that this ban will be long-lasting in your practice. Some doctors started the ban on the basis of this being her principles. Doctors understandably feel that the patient-doctor trust is not there “Just Agree to disagree and part ways”. -Facebook status of many paediatricians have emerged on facebook. I respect their decisions. They are in the best position to decide what to do as they are dealing with such cases on a daily basis. -Since the decision for the ban is a matter of trust and principles, it is difficult to later undo the ban. Because essentially, undoing the ban in the future will be equivalent to saying that your principles are changeable. That is EXACTLY what we do not want to portray to the public. 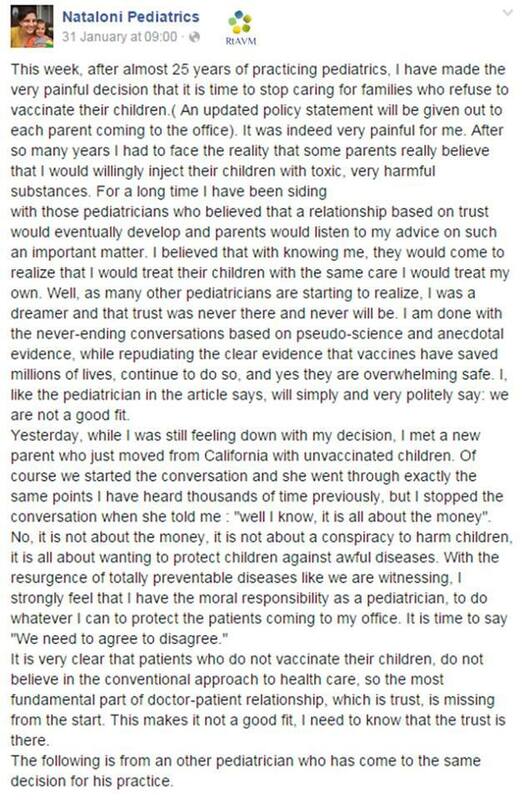 -I respect ANY pediatrician who decided to ban their unvaccinated patients from their practice. But all I am saying is, they have to be quite certain that this is going to be on a long-term basis. This ban should NOT be a mere knee-jerk reaction. If all these while, I sound like I am against the ban, well, I am not. At least, not 100%. I think, that it is quite good to have some paediatricians banning unvaccinated patients from their practice, if the purpose is to shock them into reevaluating the decision and casting off their delusions. But I maintain my argument that banning these patients will ONLY transfer spread of disease from one clinic to another clinic, from one general practice to another general practice. I am saying that, the value of the ban is less about disease control. But more for the shock value it gives to the unvaccinated patients. More for the educational purpose it gives the public. More for the convincing effect it will impart to anti-vaccers. So, some of you can go ahead and ban those unvaccinated patients. But NOT ALL doctors should ban unvaccinated patients. They should be able to go somewhere to seek treatment because that is their basic human rights. And we SHOULD refer them SOMEWHERE. I don’t think we could sleep at night if we ban them without referring. I do not envy paediatricians who have to make such decision. It must be heartbreaking to them. But I guess the educational effect it gives is not without price. Are We Ready To Consider Definitive Steps? However, definitive action must be decided upon. Like I said, anti-vaccers are not going to simply wake up one day and decide they want to get vaccinated. Outbreaks will continue to occur sooner or later, as herd immunity is gradually lost. Are we going to get surges of knee-jerk reactions every time there is an outbreak? Even worse, are doctors always going to have to contemplate making this very difficult decision against their unvaccinated patients every single time there is an outbreak? Perhaps, another way of getting out of this ethical dilemma is this: to take the decision out of the doctor’s hands and to take the autonomy out of the parents’ hands. Make it into a law…we could name it Akta Vaksinasi Kanak-Kanak 2015, or something like that. Yes, all these while, we learn about patients’ autonomy and how consent is essential in almost everything. But freedom is NOT absolute, especially when the freedom is at the expense of others and affects the whole nation. Besides that’s the function of the law: to curtail someone’s freedom for the greater benefits of others. The function of the law is to limit your rights when your rights interfere with other people’s rights (in this case, the rights for a healthy life). Are we going to create that Act? I am afraid, another ethical debate will ensue if we do finally contemplate doing that. How ethical is it to create a law that would be directly oppositional to our Constitution that says “everyone can practice their own religion and faith?” Because some religion prohibit vaccination (like Amish). See? The ethics is never ending. Maybe, those paediatricians are right after all. Tough love is the only option they have at the moment. It all goes back to ‘tough love’.